Disney is hosting a fan convention Star Wars Celebration, at the Anaheim Convention Center through the weekend. The StarWars.com has been offering live stream of the fan event and also the special panel for the Star Wars: The Force Awakens. During the panel, the director-producer JJ Abrams as well as executive producer Kathleen Kennedy showed off the new Star Wars t-shirt. Apart from that, new Star Wars emojis for Twitter was unveiled which include C3PO, Stormtrooper and new BB8 android. Luke Skywalker (Mark Hamill) narrates the trailer which kicks off with eye-catching cinematic visuals of a planet called Jakku (Not Tatooine), and then moves on to other characters. There are several noteworthy things packed in this trailer such as – Skywalker’s mechanical hand reaching out to R2-D2, an unusual looking Light Saber of Kylo Ren, and whole new Stormtrooper Army. 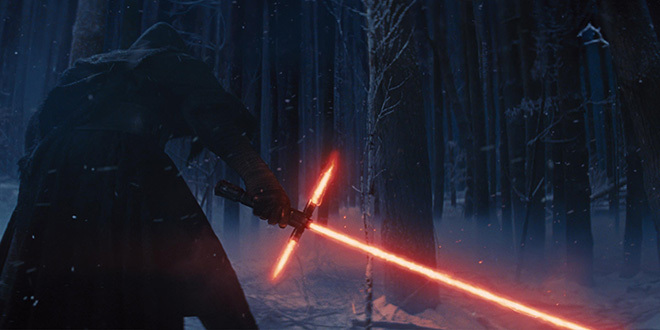 Get ready to enjoy the new Star Wars: The Force Awakens movie in Real 3D and IMAX 3D on December 18.